Newport News Lifts 890-Metric Ton Assembly (continued from page 8) project manager W.B. Miffleton. October 1981, the shipyard has laid more than 900 feet of ship and has erected steel up to the hanger deck. (A completed Nimitz- class aircraft carrier is 1,092 feet in length). "We've made radical changes in our concept of building air- craft carriers," Mr. Miffleton said. The changes involve moving new carrier construction from its pre- vious site at Shipway 11 with its 310-ton gantry crane to Shipway 12 with its modern 11-acre fab- rication facility and 900-ton gan- try crane, an area originally built in the 1970s for the series construction of commercial ships. Krupp, is the largest in the West- ern Hemisphere and enables con- struction crews to erect much larger, more fully outfitted as- semblies. Vinson 21/_> years after the keel was laid," Mr. Miffleton, who was project manager during most of the construction of Vinson, said. "But we're working with a com- pressed schedule on the Roose- velt, so we must have this kind of progress to meet our time- table." Newport News is working to- ward a target delivery date of 1986, some 14 months before the contract delivery date of Febru- ary 1988. CVN72 and CVN73. The keel on the first of those carriers is to be laid in 1984 and the second in 1986. The shipyard has delivered a total of 23 aircraft carriers since 1934, four of which have been nuclear powered. North American headquarters from Rosemont, to Glenview, 111., to provide the latest state-of-the- art services to the U.S. and Ca- nadian marine industry. West Germany, has placed more than 160 engines in operation throughout North America. Koomey Inc., of Houston, Tex- as, is offering a four-page full- color brochure describing the ca- pabilities of its new failsafe TR pressure reducing and regulator valve. Over two years in development, the regulator incorporates a fea- ture that allows it to maintain regulated pressure even if its pi- lot signal is lost. The brochure includes color-coded flow dia- grams of systems employing the valve, photos of the unit which can be used on surface and sub- sea BOP control systems to con- trol the annular (bag-type) blow- out preventer. SEA CUSHIONS.-The tough foam filled fenders with the soft touch. 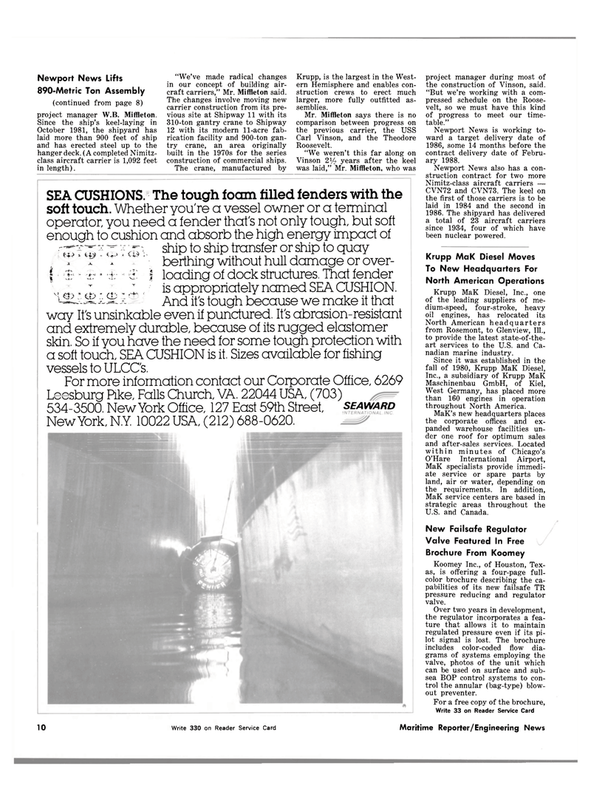 Whether you're a vessel owner or a terminal operator you need a fender that's not only tough, but soft enough to cushion and absorb the high energy impact of • : • ; rp ship to ship transfer or ship to quay t t 'T* " ' berthing without hull damage or over- f i; • r • ± | loading of dock structures. That fender ,, „ I. , 1t I., is appropriately named SEA CUSHION. %MxMkM^And it's tough because we make it that way It's unsinkable even if punctured. It's abrasion-resistant and extremely durable, because of its rugged elastomer skin. So if you have the need for some tough protection with a soft touch, SEA CUSHION is it. Sizes available for fishing vessels to ULCC's.